Australia is a great producer of honey because the warmth of our climate results in abundant blossoms, from which nectar comes. Australian Eucalypts in particular are good sources of honey and many varieties of Eucalypt can be now found right across the Heide site (Heide Museum of Modern Art, n.d.). Adult honeybees live on honey they make from the nectar they collect from flowering plants. They also feed their young with protein-rich pollen from the flowers. Besides converting nectar into honey, that is said to have healing and anti-inflammatory properties, and producing wax that we can use for candles, honeybees provide us with one of nature’s most important free ecological services: the pollination of flowering plants (Miller & Spoolman, 2012). Globally about one-third of the human food supply comes from insect pollinated plants; honeybees are responsible for 80% of that pollination. However, the populations of honeybees have been in decline, mainly due to use of pesticides and other toxins that bees pick up during pollination, which the wax in their beehives absorbs. There has also been an increase of mites and parasites that can wipe out a colony of bees in hours, and the decrease of the natural diversity of flowers and other plants on which bees feed has been contributed to their decline as a result of poor nutrition. Microwave radiation from mobile phones and communications towers has too been found to have negative effects on bees navigational systems, disorienting them and preventing them from returning to their beehives. In an experiment to test this hypothesis, mobile phones were placed near beehives and the colony collapsed within 5-10 days after failing to return from their foraging (Miller & Spoolman, 2012) . The Reeds made a commitment to restoring the native flora at Hide, which by the time they purchased the property was reduced to a barren farmland; since the early 1960’s, in addition to the kitchen gardens, they planted only indigenous trees (Morgan & Harding, 2015). 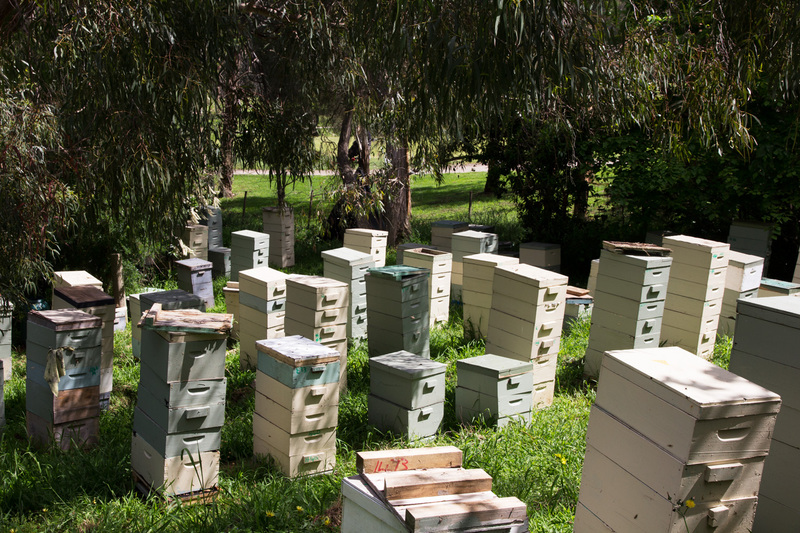 Heide has about 40 beehives (Heide Museum of Modern Art, n.d.), which aid pollination of plants across the property, sustaining the local ecosystems biodiversity. The hive’s aesthetic positioning works in a synergistic relationship with the surrounding Eucalypts and the honey produced is sold at the Heide shop to contribute to providing additional income. 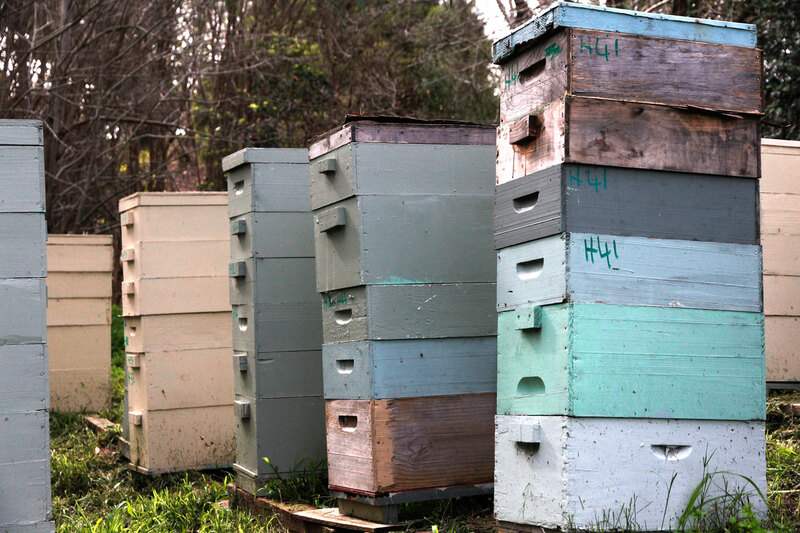 How do honeybees contribute to sustainable practices at Heide? Why are indigenous plants important to sustaining bee colonies? What difference would it make to you if most honeybees disappeared? What can we do to reduce threats to honeybees? Morgan, K., & Harding, L. (2015). Modern Love: The lives of John and Sunday Reed. Melbourne, Australia: Melbourne University Publishing.